Domain of Neptunus Rex. [At sea? : Hamburg-American Line, 1933]. [Town square], Djibouti, French Somaliland. [Photograph album of ports of call during a world cruise aboard the S.S. Resolute in 1933]. [S.l. : Hamburg-American Line?, 1933]. [Bull fight], Funchal, Madeira [Portugal]. [Photograph album of ports of call during a world cruise aboard the S.S. Resolute in 1933]. [S.l. : Hamburg-American Line?, 1933]. Mahatma Gandi in wax, Bombay, India. [Photograph album of ports of call during a world cruise aboard the S.S. Resolute in 1933]. [S.l. : Hamburg-American Line?, 1933]. [Junks], Hong Kong, China. [Photograph album of ports of call during a world cruise aboard the S.S. Resolute in 1933]. [S.l. : Hamburg-American Line?, 1933]. Canton, China. [Photograph album of ports of call during a world cruise aboard the S.S. Resolute in 1933]. [S.l. : Hamburg-American Line?, 1933]. "Cherry blossom time," Korea, 1933. [Photograph album of ports of call during a world cruise aboard the S.S. Resolute in 1933]. [S.l. : Hamburg-American Line?, 1933]. [At Baalbak, Northern Syria, old Roman ruins, Temple of Jupiter]. [Photograph album of ports of call during a world cruise aboard the S.S. Resolute in 1933]. [S.l. : Hamburg-American Line?, 1933]. 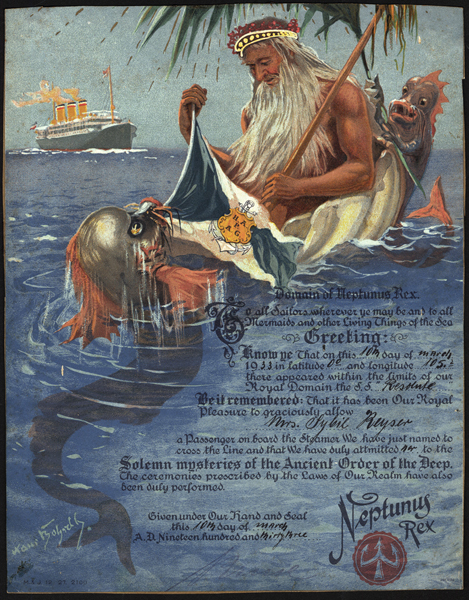 Domain of Neptunus Rex, ruler of the raging main.Matson Lines,.